11:00 AM: Set Up begins. If you are available, arrive early and help. 12:00 NOON: Dress rehearsal begins. About 2:00 PM: Rehearsal ends. Chamber Orchestra rehearsal begins. NO FOOD whatsoever in the Auditorium or in the stage area, and NO FOOD in the band room. You may eat in the hallways. Please bring water instead of sticky drinks. We will be collecting all folders at this concert so they can magically reappear with new orchestra music in them. Please remove personal items from your folders if you want said items between November 18 and the next rehearsal on December 2. There will be a large black tote box backstage to collect music. If you are not using music onstage during the concert, you may turn in your folder by placing it in the box before the concert. Just a reminder about concert attire. You do not need to wear it to the dress rehearsal (in this case, dress rehearsal means "rehearsal on the stage where we are performing"). Ladies are in black, and dresses are long enough to cover the knees comfortably when sitting. Black tights, black shoes; black slacks are also acceptable. Men are in a tuxedo or equivalent. Black jacket, black slacks, black socks, black shoes, black bow tie, white shirt. Click here for the official formal concert attire description. Last Saturday during rehearsal we had a nice discussion about audience etiquette. We decided the following items are truly important. Please let your guests know! We provide the music, you provide the silence. Noisy children and babies (if they come) should be seated with their parents, close to the aisles, in order to remove them from the auditorium quickly should they become distracting to other audience members. If you arrive during a piece of music, please remain in the back or outside the auditorium until applause indicates the piece has ended. Then find your seats quickly. If you are not sure when to applaud, just watch the conductor. He will put his hands down and turn around to face the audience. That's your signal for warm and happy applause. No whooping or shouting names, cat calling. This is not a sports event. Keep your phones off or silent, and enjoy the live concert. 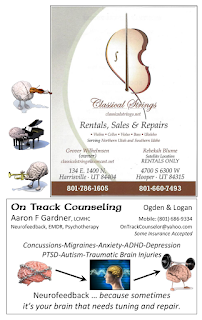 The youth symphony will join the audience during the chamber orchestra performance. We need to set the example of how to be a great audience! The program is attached to this email. It's already gone to be printed, but do let me know if you see any problems. Thanks! 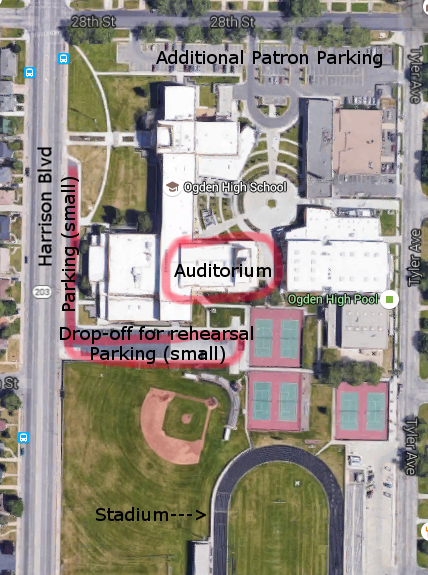 Ogden High School is a city school and depending on when you arrive, you may need to park along the street through the block on Tyler Ave. 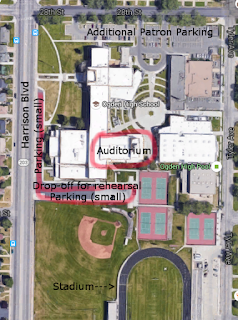 Please advise your guests to leave plenty of time to find parking and walk to the auditorium. The concert will begin on time.